This Solaire InfraVection Freestanding Gas Grill features commercial 304 grade, 18 gauge stainless steel construction with heli-arc welded seams, hand-polished mirror finish, and no mechanical fasteners; top-supported, self-trimming design; stay cool double skin hood; full-width stainless steel knurled tubular handle; one stainless steel convection and one ceramic Infrared main gas burner for a total of 55,000 BTUs; 703 sq inches of cooking surface (455 sq inches of main grilling area); stainless steel V-shaped grilling grates that catch drippings to enhance flavor and reduce flare ups; removable stainless steel warming rack and drip tray; and pushbutton rapid-start ignition. Burners are easily removable for cleaning. Includes Solaires stainless steel cart base which features double access doors with internal storage, hidden casters, and two fold down side shelves. 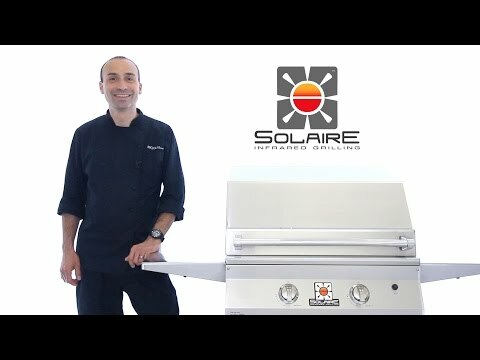 Solaire have a limited lifetime warranty on stainless steel construction, main burners and V-grilling grids. Includes standard grill cover. Cooking Grid Dimensions 25 3/4 X 17 7/8"
Great grill - Infra red perfect for juicy steaks & burgers! Love this grill. A real sturdy workhorse. Easy to disassemble and clean. 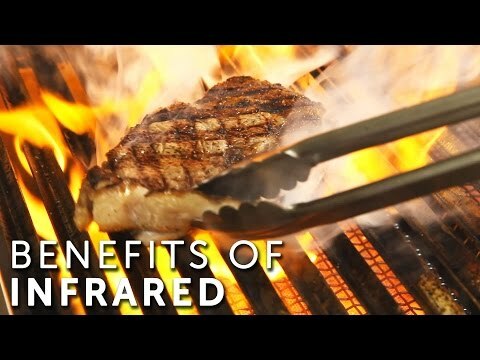 Infra red is ideal if you like medium rare, juicy steaks & burgers. Expensive, but you get what you pay for. I've had this grill for 10+ years. Any parts that you need to replace are easy to find and staff are helpful. A great grill!!! I will need a lot of time getting used to this grill. Have an older Weber that I am keeping for indirect method. So far I cannot get the middle of the food cooked like hamburgers without burning the outside. No verdict yet. When I read the directions for the rotisserie found out that you need to verify that the thumb screws don't come loose and so the meat sits still while the spit keeps turning. This will ultimately start the meat on fire. Do not use this grill when raining! 25 3/4 X 17 7/8" 24 1/2 X 19 15/16" 26 1/4 X 22" 24 X 18"